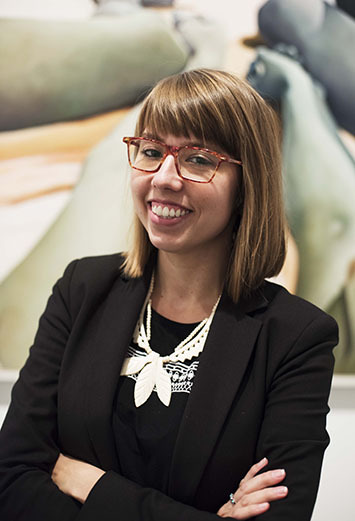 Carmen Hermo joined the Elizabeth A. Sackler Center for Feminist Art’s curatorial team as Assistant Curator in June 2016 and was appointed Associate Curator in 2018. She curated Roots of “The Dinner Party”: History in the Making (2017), co-organized Marilyn Minter: Pretty/Dirty (2016–17), the Brooklyn presentation of Radical Women: Latin American Art, 1960–1985 (2018), and Half the Picture: A Feminist Look at the Collection (2018), and assisted with initiatives for the 10th anniversary of the Sackler Center, A Year of Yes: Reimagining Feminism at the Brooklyn Museum. Carmen also works to support the permanent collection and serves on the Council for Feminist Art and Young Leadership Council patron groups.